Art With Mr. E: I'm a Stylish Blogger? 1) Link back to the one who gave you the award! 3) Pick other bloggers that you feel should get the award & post their links with this post. 1) I did not have art till I was in high school. 3) I have sang in front of thousands of people. 4) I did my student teaching in Montreal, Quebec. 5) I lived in Istanbul, Turkey for a summer...AND LOVED IT! 7) I auditioned for Biggest Loser..but didn't make it(don't think I was big enough for them). Ms. Malone's Art Room ( http://msmalonesartroom.blogspot.com/ ) - Ms. Malone is actually one of my best buds. Like the little sister I never wanted(ha ha). We went to undergrad together in Ohio, she moved down to Nashville to teach after I went and spoke to BGSU's art ed department, grad school through U of I's online MAT program together, and we've served on a million teams together for MNPS. Art Matters ( http://artchattermatters.blogspot.com/ ) - Mrs. Fritz & I started teaching in 1997...as part of the 80 art teachers MNPS hired to fill every elementary school. She is part of the original art gang...and is truly like family to me. She also joined Janet & I on obtaining our masters through U of I. She has been at the same school since 1997(which is pretty amazing I think). 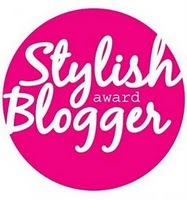 I love the idea of you being a "stylish blogger" with a pink award on your blog. Very sweet! I also love reading all the things people write about themselves when they are given one of these awards. I was amazed that you auditioned for Biggest Loser and am glad to hear you weren't large enough to get on the show. A teacher in my school and his wife went to Biggest Loser "camp" a couple of summers ago and lost a ton of weight! I think if you had gotten on the show it would have been hard for you to be away from your students, wife, and kids for so long. Anyhow congrats on being stylish - I have been appreciative of you since I began blogging and you explained to me (duh) that I had to backspace to delete all those extra spaces that show up when you add photos to a post. thanks!